PATNAGARH:The accused in the parcel bomb explosion case, Punjilal Meher, was taken to Raipur by the Crime Branch on Saturday morning. 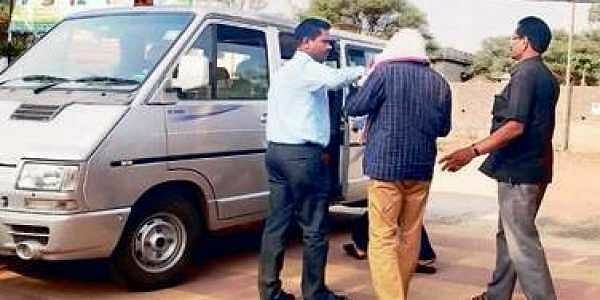 Earlier, the CB had taken Meher on five-day remand starting from Wednesday.After interrogating him at Kendu Leaf IB since Thursday, Punjilal was taken to Raipur during the final stage of investigation. According to sources, the Crime Branch team will take him through routes used by him when he went to Raipur on February 15 to send the killer parcel. Punjilal would also be taken to two courier outlets which he visited to book the parcel bomb, sources said. The Crime Branch will confront Punjilal with the auto rickshaw driver with whom he went to the courier. Earlier, Crime Branch IG Arun Bothra had left for Raipur to join the SIT of Crime Branch camping there. According to reports, the SIT had traced the rickshaw driver. As the remand of Punjilal will expire on May 7 and he has to be produced in court, the Crime Branch will try to tie the loose ends of the case in Raipur.